A Fire Pump Maintenance Program is a necessary part of fire protection and safety. The fire pump is part of the fire sprinkler system water supply. It allows the water to flow at a higher pressure to ensure you can put out a fire quickly and efficiently. If the pump doesn’t properly function during a fire, it could result in a significant financial loss due to damages. That’s why it’s so important to know how to maintain your fire pump. 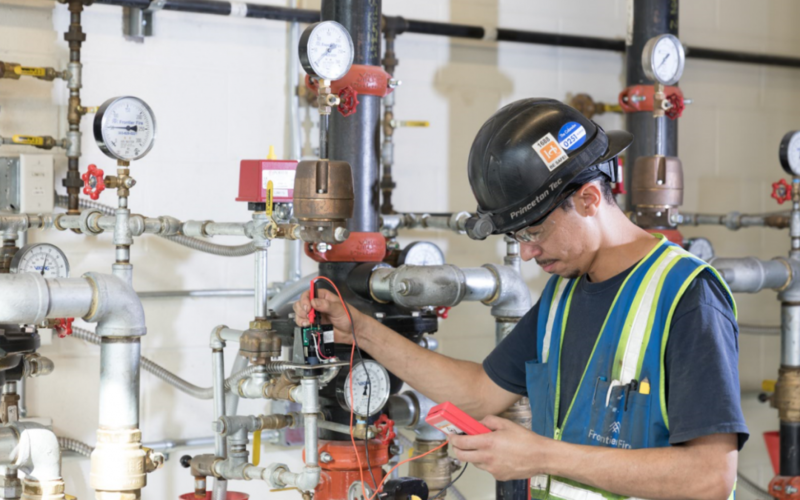 Our Fire Pump Maintenance Program will help you know exactly when you need to schedule tests and services to keep your pump in optimal condition. The following tasks should be scheduled on a regular basis throughout the year to ensure your fire pump remains up to par and fully functional. To test the fire pump, start the booster or diesel pump as if there was an actual fire. The sprinkler head will turn on and the pressure in the system will reduce, causing the pump to start working. In order to test the type of automatic start, you can allow a test line to open and reduce the system pressure. To test the driver, run the engine at a rated speed for 30 minutes, allowing the pump to discharge water through the relief valve and into a drain. Keep in mind that it will take 20 minutes for the engine to warm up, giving the engine enough time to surface any issues if there are any. For an electric-motor drive, check the starting devices and run the pump for 5 to 10 minutes every month. The pressure relief valves are there to prevent the pressure from building up and exceeding its limit. Generally, you will want to make sure there is no water being discharged through the valves. Check the pump and feel the casing and bearings to make sure there are no leaks or issues with overheating. Make sure all valves on the suction line are properly working for public supply booster pumps. Visually examine the suction tanks. During the colder season, you should apply heat to the supply lines and suction source. If there are open bodies of water then you should make sure there are no barriers in the suction intake. During the warmer season, make sure that the warm and dry conditions haven’t caused your water supply to dry up. The pump room should be kept at a minimum of 40 degrees Fahrenheit. For the internal combustion engines, the room should be kept at a minimum of 70 degrees Fahrenheit. Ensure the fuel tank levels are at least three quarters of the way full. If the crankcase oil is contaminated or changes in consistency then you should change it out. Make sure the batteries and the charger are properly working. Clean the water cooling system strainer when needed. Check the engine instruments including the oil pressure, rpm, and temperature amps. Record the discharge pressure readings for multiple flow volumes. This way you can plot the data on a chart and evaluate the rates overtime. Typically there shouldn’t be much of a difference between pump tests. You could see the capacity reduce up to ten percent per time due to normal wear and tear, but that should be it. Check how fast water is discharged from the exhaust manifold and heat exhaust. Frontier Fire is Colorado’s leader in fire protection. We can help you with your Fire Pump Maintenance Program to ensure your equipment is properly working and kept up to date. If you’re ready to speak with a qualified fire protection specialist, give us a call today at 303-629-022.